An unqualified success — That is how Trinity Health and Minot State University officials describe a program aimed at generating more baccalaureate degree nurses for North Dakota’s future. In 2011, Trinity Health committed $1 million over a five-year period to expand enrollment capacity in MSU’s Department of Nursing and increase opportunities for nurses to obtain their Bachelor of Science in Nursing degrees. With the fifth and final payment presented, Trinity and MSU officials are taking stock of the initiative, calling it a clear winner. MSU utilized the $200,000 per year to help fund three full-time positions, including two nursing faculty positions and an administrative assistant, to manage the surge of students. Trinity Health Vice President and Chief Nursing Officer Karen Zimmerman, RN, MSN, said Trinity also benefited from the investment by ensuring a more robust pool of nursing graduates from which to recruit. The five-year initiative is just one of the ways Trinity and MSU have collaborated through the years. Trinity Health provides a wide variety of clinical experiences for student nurses, a critical component of nursing education. MSU nursing faculty collaborate with nursing staff and leaders at Trinity Health to provide excellent learning opportunities and experiences. In addition, Trinity’s own Nursing Scholarship Program for employees affords staff possessing licensed practical nurse and associate certificates a chance to pursue their BSN degrees. A 2010 Institute of Medicine report on the future of nursing recommends that 80 percent of the nurse workforce be educated at the baccalaureate level by 2020. Pictured, left to right, are Karen Zimmerman, Niki Roed, Karen Krebsbach, legislator from Minot’s District 40 and MSU alumna, and MSU President Steven Shirley. Chad Dahlen, rancher and educator, will present “Success Stories of Two Generations of Three Tribes Males” Wednesday (Nov. 18) in Minot State University’s Aleshire Theater at 7 p.m. Dahlen’s presentation is part of the Northwest Art Center lecture series and an Native American Cultural Celebration event sponsored by the MSU Native American Center. Dahlen is conducting research on Native American fathers and sons who have both graduated from college. “I will be taking a critical look at how tribal members are able to navigate through the cultural barriers of high school and college and still graduate and become successful,” Dahlen said. Dahlen’s presentation will focus on the role of the Native American researcher, explaining the research technique of Portraiture (using words and storytelling), as well as Tribal Critical Race Theory and Leadership and Transcultural Theory as they apply to Native students and curriculum. A member of the Mandan, Hidatsa, Crow and Lakota tribes, Dahlen operates a family ranch near Twin Buttes and Halliday and has been a teacher and administrator in the New Town and Twin Buttes school systems. He graduated from Halliday High School and Lake Region State College. He continued on to earn a bachelor’s degree in psychology and education at Minot State and a master’s degree in education administration from the University of Mary. He expects to complete his doctorate in educational leadership from the University of North Dakota in 2016. Minot State University’s Native American Cultural Awareness Club is sponsoring the Native American Cultural Celebration in November. The commemoration will include speakers, presenters and exhibits of Native American success and culture. Wednesday (Nov. 18), 7 p.m. — "Success Stories of Two Generations of Three Tribes Males" presented by Chad Dahlen, rancher and former educator. Dahlen will use portraiture storytelling for his presentation in Aleshire Theater. This is in conjunction with the Northwest Art Center lecture series. Thursday (Nov. 19), 10-11:15 a.m. — AnnMaria De Mars, chief executive officer of 7 Generation Games, will discuss the company's video games that combine math, Native American history and adventure gaming. De Mars will also present to Burdick Job Corps and the Mid Dakota Education Cooperative that day. Thursday (Nov. 19), 1 p.m. — Duane McGillis, community elder, will speak on the significance of powwow regalia and music. Friday (Nov. 20), 11 a.m.-noon — The Metis Prairie Steppers, a First Nations dance group from Portage la Prairie, Manitoba, will dance and give the history of the Metis people. Audience participation encouraged. NACAC and the North Dakota Center for Persons with Disabilities, a Center of Excellence at MSU, are sponsoring this event. For questions, contact Annette Mennem, Native American Center director, at 858-3365 or annette.mennem@minotstateu.edu. Efrain Amaya will direct the Minot Symphony Orchestra Saturday (Nov. 21) in “Emotionally Charged!” its second concert of “From the New World,” its 90th season, in Ann Nicole Nelson Hall at 7:30 p.m. MSO will perform “Finlandia” as it continues to celebrate the 150th birthday of Jean Sibelius, Finnish composer. Jon Rumney, concert master and music professor, is the featured soloist for “Poeme,” one of the most beautiful works for violin and orchestra. Minot readies for the annual performance of Handel’s “Messiah” with this invitation for singers. This year marks the 104th anniversary of the first performance of “Messiah” in Minot and the 84th consecutive Minot performance. 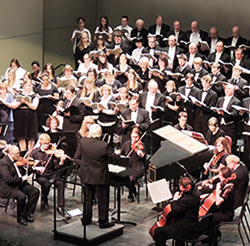 The Minot Heritage Singers, Voices of Note and the MSU Concert Choir invite all singers, high school age to adults, to join them in singing the Christmas portion of Handel's “Messiah” on Dec. 6 at 4 p.m. in Ann Nicole Nelson Hall. The choir and performance will be conducted by Kenneth Bowles, Division of Music chair, and accompanied by a combined Minot State University and community orchestra. The invitation is open to all area singers. Participants will be expected to attend at least two of three rehearsals scheduled for Sunday (Nov. 22) and Nov. 29 starting at 4 p.m., and the dress rehearsal prior to the concert on Dec. 6. Rehearsals will take place at Ann Nicole Nelson Hall. Singers may choose to participate by calling Bowles at 858-3190 or by showing up at the first rehearsal. No reservation is needed. For more information, call the Division of Music at 858-3185. Musical scores will be available for purchase if needed. Singers are also encouraged to bring their own. As in past years, proceeds from the performance will go to the Joe Hegstad and John Strohm memorial scholarship funds. The concert will be taped and locally televised over the holiday season. The Student Social Work Organization experienced unprecedented warm temperatures for its Nov. 14 Freezin’ for a Reason. SSWO raised awareness of hunger and homelessness in Minot and collected monetary contributions and nonperishable food items. The beneficiaries were the Minot Area Homeless Coalition and Community Action Partnership-Minot Region. “The Interview,” the third event of the “Are You Workplace Ready?” series at Minot State University, featured Julie Vetter, North Dakota competency supervisor, and Rachel Allison, senior competency technician, both from Hess Corporation. Tailored for students, regardless of major, they learned about how competency-based interviews can be helpful in any industry. Vetter and Allison used a process designed to identify future team members who demonstrate critical thinking and problem-solving capabilities. Vetter foresees Hess Corporation and Minot State collaborating in the future. 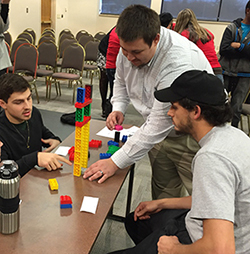 The Student Success Center launched the “Are You Workplace Ready?” to prepare MSU students for situations that can arise in the employment search or workplace. For questions, contact Tammy Wolf, student services advisor, at 858-3362 or tammy.wolf@minotstateu.edu. 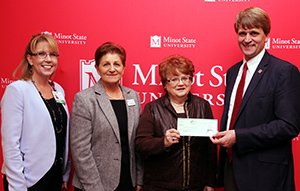 Members of the American Petroleum Institute's Bakken Chapter recently presented $5,000 to Minot State University’s Development Foundation, completing the distribution of funds to local charitable causes or organizations. The contribution will fund scholarships. The Bakken Chapter, the first new API chapter formed in North Dakota in 20 years, recently raised $35,000 from a golf tournament at Souris Valley Golf Course. 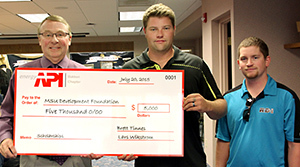 “The tournament is a big fundraiser, but it won't be our only one,” said Lars Wikstrom, chapter president. "We are committed to the community we live and work in." Pictured, left to right, are Marv Semrau, MSU vice president for advancement, Lars Wikstrom and Brett Tinnes. API is a trade association whose members represent the various businesses that make up the oil and gas industry. Members meet monthly. To learn more about API Bakken Chapter, go to http://www.bakkenapi.com/. Minot State University welcomes new employee, DeAna McAdovy, a POWER Center academic coach. Previously, she worked at Bell Elementary School in rural Minot. She holds a bachelor’s degree in chemistry from Alabama State University and a master’s degree in chemistry from the University of Alabama. Her husband, Daniel Clayton is an associate professor of chemistry at MSU. Nov. 18-Dec. 3 — "Fluid Nature,” acrylic paintings by Mali Vargas, Calgary, Alberta, Library Gallery. The closing reception is Dec. 3 in the Library Gallery, 6:30-8 p.m.
Nov. 19-Dec. 30 — "The Space Between History and Hollywood," mezzotints by artist Linda Whitney of Valley City, Hartnett Gallery. Dean Frantsvog, associate professor of finance, presented two papers, “Technology and Law: How Information Technology Has Transformed the Practice of Law” and “The Reduction of Graduate School Requirements in Order to Aid Students, a Counter Perspective” at the Academic and Business Research Institute in Las Vegas, Oct. 14-15.